Josh Smith Was Born October 7, 1979 In Middletown, Connecticut. Before He Was 1, His Family Relocated To Florida, Eventually Settling In Pembroke Pines, A Suburb Of Fort Lauderdale. At Age 3, He Received His First Guitar And At 6, He Started Taking Guitar Lessons. 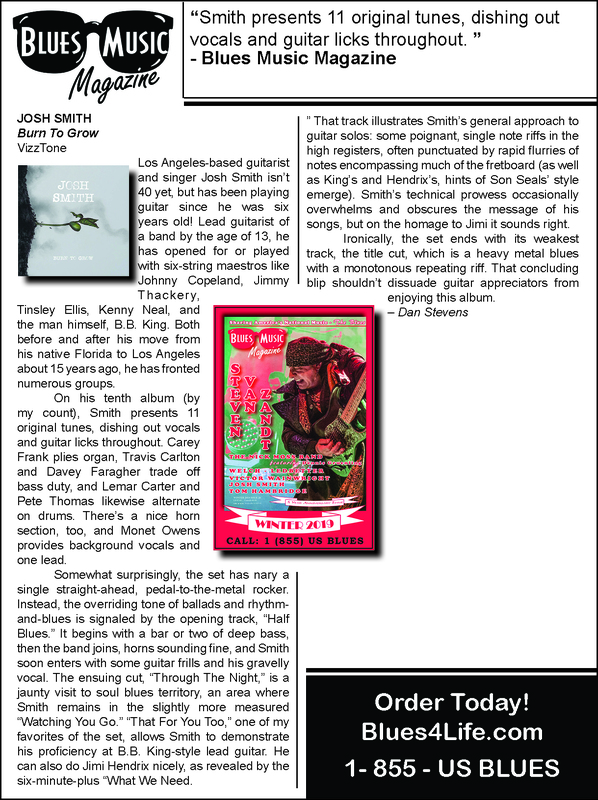 Since releasing his debut album as a 14-year-old in Florida almost 25 years ago, Josh Smith has toured the US and the world, released ten self-produced albums, and joined the most elite ranks of young blues-based guitarists. In 2002 Smith relocated to Los Angeles, where he made a name for himself as a session guitarist, sideman and producer. In addition to his own gigs Josh has done extended tours as guitarist for international stars including Taylor Hicks and Raphael Saadiq, and in between his own gigs can be found collaborating and jamming with friends and peers including Kirk Fletcher, Joe Bonamassa and Eric Gales.